In today’s world of tweets, likes, and shares, it can be a challenge finding the best ways to effectively communicate about priorities across the marine, coastal, and freshwater fields. Whether you’re celebrating a victory for ocean protection or calling attention to flooding risks in coastal communities, it’s important to think about ways to amplify and educate in a manner that brings people together. 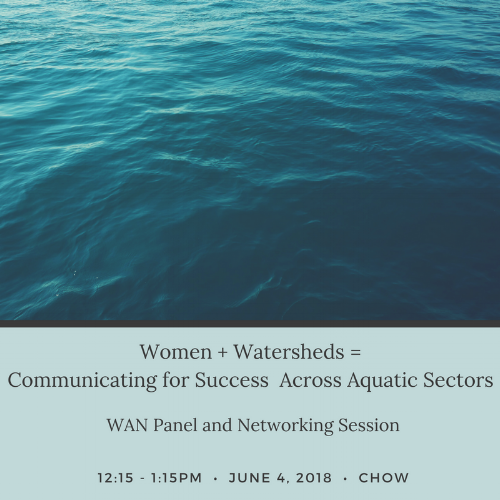 Join the Women's Aquatic Network for a panel and networking opportunity at Capitol Hill Ocean Week to share ideas for successful communications on Tuesday, June 5, at 12:15 to 1:15 p.m. in Hemisphere A of the Ronald Reagan Building and International Trade Center. Convened by the National Marine Sanctuary Foundation every June, CHOW brings together more than 600 national and global policymakers, scientists, scholars, businesses and conservation leaders to address pressing science, conservation, and management issues facing our ocean and Great Lakes. Thanks to our panel co-sponsors at CHOW! Restore America's Estuaries is a national alliance of 10 coastal conservation groups that stretch from Rhode Island to Washington State. Local projects restore coastal wetlands, improve water quality, open fish passages, build living shorelines, re-plant salt marshes and restore shellfish habitat. Coastal States Organization represents the 35 U.S. Coastal States, Territories & Commonwealths on ocean, coastal and Great Lakes resource issues. CSO supports working groups that focus on coastal resilience in the face of climate change, management of health beaches and inlets, and supports information sharing between states and federal agencies to facilitate responses to water quality related issues. The Sea Grant Association (SGA) is a non-profit organization dedicated to furthering the Sea Grant program concept. The SGA's regular members are the academic institutions that participate in the National Sea Grant College Program. The SGA advocates for greater understanding, use, and conservation of marine, coastal and Great Lakes resources.